Following the attack on Pulse nightclub in Orlando Sunday that took the lives of 49 victims, most of them Latino gay men, the New York Times reminds us of earlier attacks on the gay community, among them an infamous arson case at a gay-friendly church in San Francisco in the summer of 1973. The worst previous case of an act of terror and brutality on the LGBT community was the torching of the UpStairs Lounge in New Orleans on June 24, 1973. The bar was known as a place frequented by parishioners of the Metropolitan Community Church (MCC)  a gay-founded religious organization that began with a "mother church" in Los Angeles, which itself fell victim to an arson attack in January of that same year. The fire at the UpStairs Lounge in June, in which a person or group of people who were never found doused lighter fluid all over the stairs leading up to the second-story bar, was a horrific conflagration that claimed the lives of 32 people, many of them gay parishioners at the nearby MCC. The NYT notes the particular tragedy of the time in which the attack took place, just four years after the Stonewall Riots. Thirty-two people died, and many others were injured. Many of the people who died were unidentifiable, not only because the fire scorched their bodies, but also because, despite the celebration of gay liberation, many gay men were not out of the closet and used fake IDs and aliases in gay bars. Even their families didn’t know they were there. Only weeks later in what seems to have been a copycat arson, the Metropolitan Community Church on Guerrero Street in San Francisco was burned down, on July 27, 1973. Thankfully no one was injured in the blaze, and the nearby Mission Presbyterian Church at 23rd and Capp Streets invited all the MCC's gay and lesbian parishioners to their service that Sunday, and the entire group marched from the burned-out church that evening singing  just as SF mourners did last night at City Hall  "We Shall Overcome." The MCC went about its mission in many unconventional ways. As they say on their website today, "We are a spiritual community which affirms that you are beloved! Rooted in the Christian tradition, our members come from a variety of spiritual backgrounds. We believe there are many paths to the holy, and that our sexuality and genders are sacred gifts." And as they recount on this timeline, they passed out flyers in gay bars in the early 70's saying "bring a trick to church," and even held Easter Sunday services at a SoMa bathhouse, "replete with baptisms and 'fellowship.'" Gay bars were also the targets of firebombings and arsons in this era. The original Toad Hall in the Castro (where, currently, the upstairs portion of Walgreen's is near 18th) was also hit by several fires between 1973 and 1974, at least one of which, shortly before it was set to reopen following a reconstruction, appears to have been set on purpose. 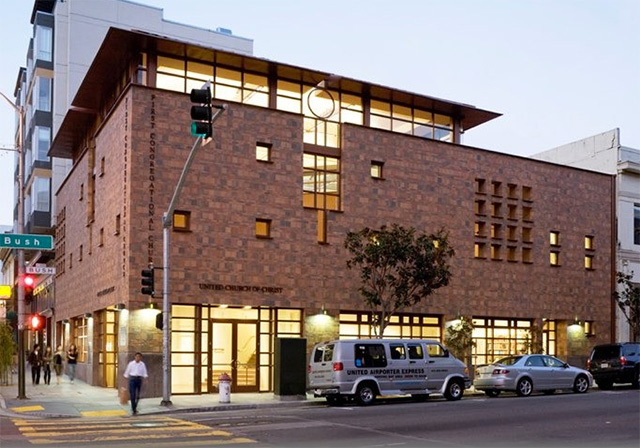 During the AIDS crisis of 1980's and '90's, from their new church at 150 Eureka Street, the MCC ministered to the ill, dying, and mourning with various support groups and services. See a video history here, put together by the GLBT Historical Society, about the history of the MCC in SF. Now, as of 2015, the church shares a handsome home with the First Congregational Church at Polk and Bush, pictured above, and they continue to welcome all kinds of spiritual traditions, including Buddhism and others. And, last night, members of the church gathered with about 10,000 others in the LGBT community to march from the Castro to Civic Center, and led the group in "We Shall Overcome" once again. The current home of the MCC on Polk Street, courtesy of the church.